90 Pts - This intense classically styled, clay-grown wine is packed with complex berry fruit, beautiful tannins and subtle wood spice. 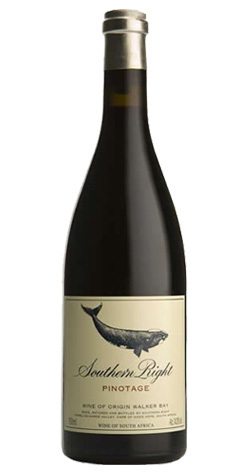 Southern Right is re-defining Pinotage with this intense classically styled, clay-grown wine, packed with complex berry fruit, beautiful tannins, and subtle wood spice. Full ripeness and the longer hang-time afforded by cooler sites, combined with the complex, more classic fruit aromas and structure resulting from clay-rich soil, make this wine a highly individual expression of South Africa’s unique grape variety. Southern Right is a small Pinotage and Sauvignon blanc specialist located on a strikingly beautiful 448 ha property in the cool, maritime, Hemel-en-Aarde Valley appellation, just behind the old fishing village of Hermanus. Founded by Anthony Hamilton Russell in 1994, Southern Right’s aim was to produce a serious, age-worthy Pinotage combining a distinct South African fruit and flavour expression with classic styling and refinement. It is Anthony’s belief that as an early ripening grape, Pinotage is best suited to cooler areas. It was also his conviction that the stony, high clay content, shale-derived soils on the sites he chose for the vineyards, were best suited to creating the more classic style he was aiming for. Rigorous yield management and extreme care to ensure harvesting at full physiological ripeness, combine with the terroir to re-define South Africa’s red grape variety.